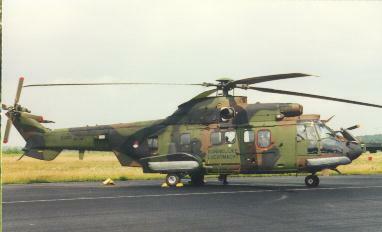 The Eurocopter AS 532 U2 Cougar Mk II is operated by the Dutch Air Force [KLu] on behalf on the Dutch Air Mobile Army Brigade. It seemed very nice to have a large 1/32 model of this helicopter in the collection and as Matchbox issued a 1/32 Puma kit (later improved and issued by Revell), a conversion project was started. But first let's look at a brief background of this chopper. The Eurocopter Cougar AS 532 helicopter is derived from the Super Puma and in fact the Puma helicopter developed by Aerospatiale and Westland emerging the mid nineteen-sixties. 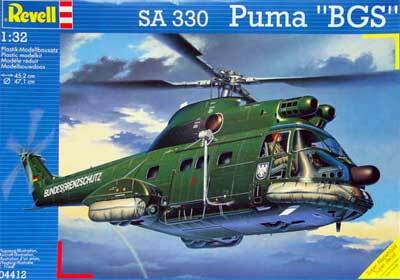 The original Puma helicopter designated SA 330 was a tactical transport helicopter and the first production Puma flew in 1968. It was and still is used by many air forces and by civil operators. It has a crew of 2 pilots and a navigator and a cabin for maximum of 16-20 troops or passengers. 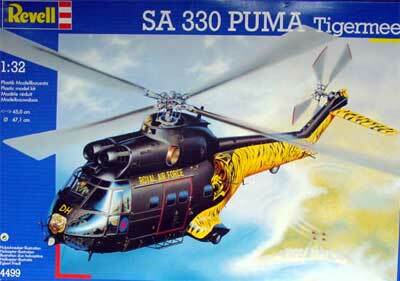 The Puma has a maximum take off weight of 6400 kg with two Turbomeca Turmo engines. The rotor has a diameter of 15 meters and its overall length with rotors turning is 18.15 m. Fuselage length is 14.06 m and its maximum speed about 280 km/hour at sealevel. Fuselage modifications: cabin plug with a 0.76 m forward section as compared to normal Puma with also new longer radarnose; rear section is quite different as compared to Super Puma with new composite fairing and shorter tailboom ; Overall, the AS 532 U2 fuselage length from forward radarnose to atmost tailtip (exclusive rotors) is 16.27 m (50,8 cm in 1/32 scale or 22.6 cm in 1/72 scale ). 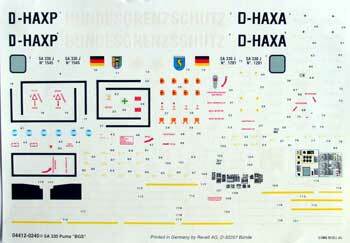 Matchbox (owned by Lesney) issued a large model in 1/32 of the SA 330 Puma in 1980. Kit number was PK-507. It was a very nice kit and at the time quite impressive with many parts including engines. It has decals for no less than 4 liveries including RAF and the company Puma demonstrator. The kit parts are basic but usable for the conversion and it was at the time one of finest kits issued by Matchbox. #04499 with some improvements to the original Matchbox kit. It has additional new sprues with parts for the interior, much better pilot seats, intake filters and various other improvements. 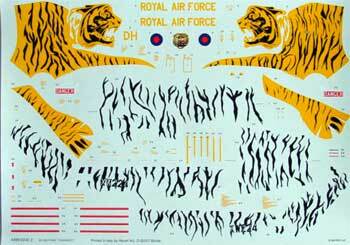 It came with a large decal sheet comprising a spectacular Tigermeet scheme from a RAF Puma. Revell also later issued another update on the Puma kit. 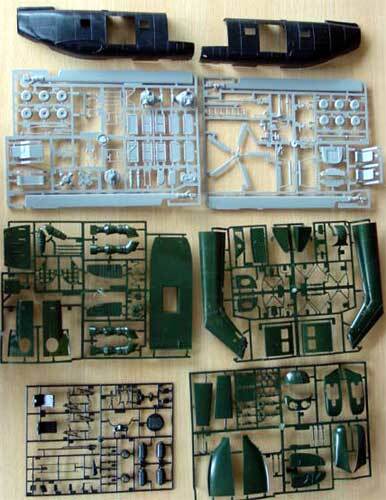 Kit #04412 has again some added some sprues with extra parts enabling the building of a German BGS ( Bundes Grenz Schutz) "border patrol" Puma, with larger side sponsons/fairings and a radar nose protruding antenna. 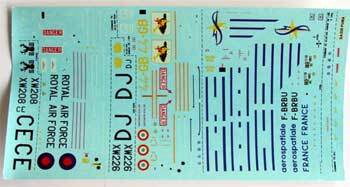 Extra BGS parts & decals; the kit has also the parts of the Revell kit #04499. 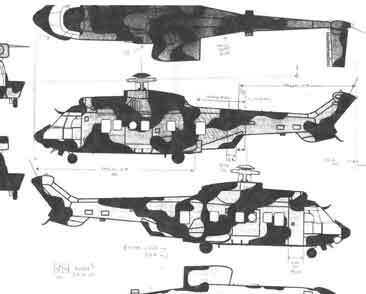 The 1/32 scale conversion project for the Dutch AS 532 Cougar can use either of these Puma kits. 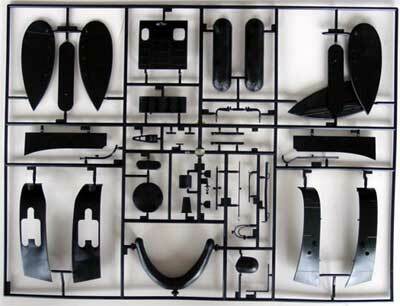 It is noted that any of the Revell kits are recommended as you get some finer updated parts and the intake filters. To extend the fuselage and rotor blade diameter however, two Puma kits are required to save some work. I obtained an old Matchbox Puma and a newer Revell #04499 kit to be used in the conversion Cougar project. The Dutch AF Cougar can be made as in model in various configurations. It is flown with two types of main gear interchangeable sponsons: a smaller type and a larger type (note that the larger one is very different than the ones in the BGS kit). Also, various engine exhaust configurations are seen with sometimes a JDD, jet diffusion devices which is in fact a Infrared protection fairing . There are also various other changes, so scratch building will be required any way. 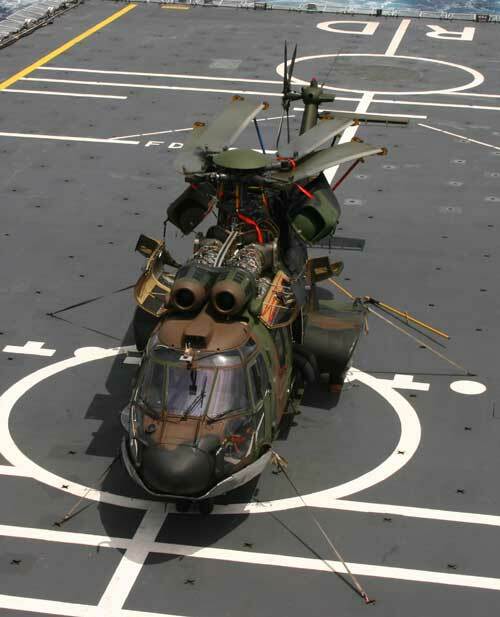 It was decided to make a Dutch Cougar as flown during flying qualification tests from Dutch Navy Assault Transport ship HrMs Rotterdam in 2005. Also, a lot of folding blade test were done on deck to check handling and behaviour. This is an interesting setting, and for me as a modeller: it would save a lot of space later on in the model display cabinet!